WWE WrestleMania 35 is taking place at MetLife Stadium, East Rutherford, New Jersey. WWE legendary superstar Kurt Angle loses his career last match against Baron Corbin. This was indeed an emotional moment for the Olympic Gold medalist, as he walks out in the ring for one last time. WWE WrestleMania 35 April 7, 2019 Live Streaming & Full Match Card: Preview, TV & Free Online Telecast Details of Today's Fights. Angle was well greeted when he stepped out on the ramp to display his talent for one last time to WWE universe. We saw Kurt giving suplexes and ankle locks. However, while jumping from turnbuckle, Kurt Angle misses the target of hitting Baron Corbin and ended up getting the finisher from Corbin, which lead to the pin fall. 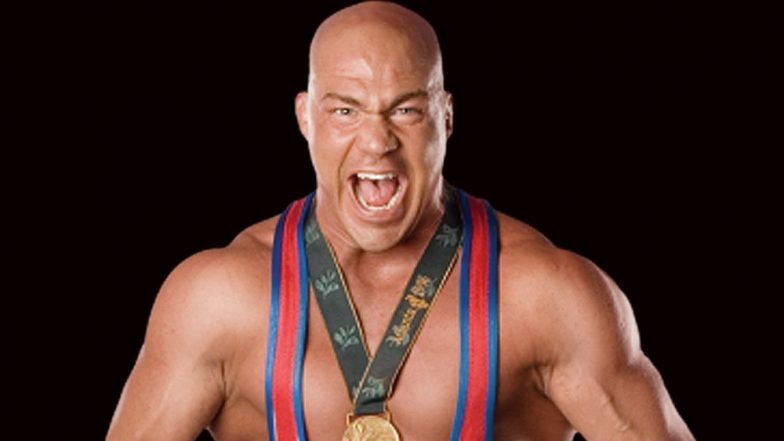 Kurt Angle thereby lost his career farewell match at WrestleMania 35. Let us have a look from some of the moment from this historical match. WWE WrestleMania 35 has achieved a new record of 82,265 people attendance at MetLife Stadium, New Jersey. Meanwhile, WrestleMania show is cruising along well. Stay tuned to our website Latestly for more updates on this flagship event of WWE.